Therese Crisostomo Pangelinan: I am a resident of Inarajan. I have been living in Inarajan all my life. Im a Crisostomo, by birth, but Pangelinan by marriage. Both my parents are Chamorro. 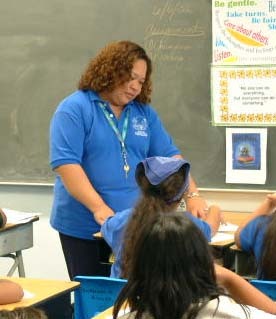 My mom has passed on but she was a very well known and respected teacher. As I grew up, I watched and learned many things from my mom, and picked up the love of teaching. My dad is retired from the Government of Guam. All of my family reside in Inarajan. "My grandfather is originally from Hagatña, and then his family moved to Barrigada. 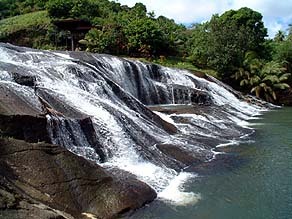 So we have a connection with the Crisostomos in Barrigada in the northern part of the island. I guess because my grandmother is from Inarajan, my grandfather decided to move down here and live down here, and he resided in Inarajan until his death. He always called Inarajan home. Bill Paulino: "Im from Inarajan. I grew up in Inarajan and right now, Im 54 years old. I worked with the Department of Education, where I was the administrator of Chamorro Studies and special projects, and then the last thing I did with that department was, we created a degree program at the University of Guam, Chamorro Studies at the university level. I was very happy that that went through. I was also a member for about six terms as Commissioner for Chamorro Language Commission. I was deeply involved with things like that." Anne Perez Hattori: "My family and my clan is Titang. My mom is originally from Hagåtña but after the war, they moved to Chalan Pago and my father is from Hawaii, actually Japanese from Hawaii. 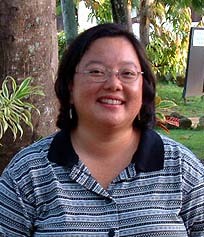 I am a professor of History here at the University of Guam, teaching primarily Guam history and History of Micronesia, and also Pacific history." Tan Floren Meno Paulino: "I lived here, before. I grew up here in Inarajan. This is where I was born. Before we had like this kind of house," Tan Floren gestures to the thatched huts of Gef Pa'go cultural village, where she demonstrates traditional weaving. "But when we had a little money, my brother saved, and we built a concrete house. Since Typhoon Paka knocked out our old house, we had to move up to Malojloj. My house is not hard to find, just by the highway. 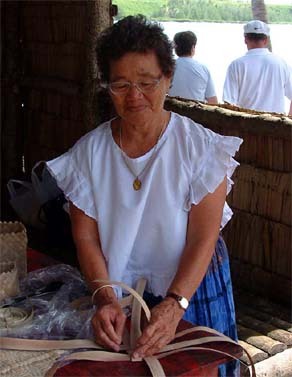 "I learned pandanus weaving when I was small. At school, some of them were teaching us. But I just kept doing it a little at a time, and now Im here at Gef Pa'go village." ("Tan" is an honorific used for female elders ; "Tun" is used for male elders). Ben Meno: "Ever since I was a young boy, I was so interested in my community and my people, the culture and tradition, so I wrote those things down. 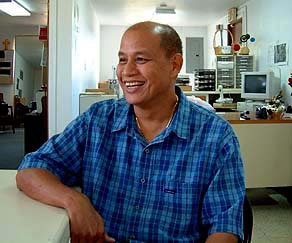 I learned weaving and carving, and also Im a singer in the Chamorrita. I teach people, I share this knowledge, because people should not take such beautiful knowledge and lock it in the heart and the mind. "As Jesus explained in the Gospel, no one should light a candle and cover it with a basket. You light the candle and expose it, where it will take you where you want. Theres beauty in everything--the rain, the wind, and the sun. Even the pounding of the water, the big waves, theres beauty in that." "I was born in Inarajan during World War II; you might say that I came into this world a 'prisoner of war.' I am proud of my 'southern' origin and I still live in the south - Talofofo. I am a student of Guam history, her culture and her people. I am also a peace and human rights activist, an environmentalist, and a person concerned with making Guam a better place to live for everyone making the island their home." Larry Cunningham and Judy Flores. We have also had valuable input from Larry Cunningham, adjunct professor of Micronesian Studies at the University of Guam and author of many publications on the ancient Chamorro; Judy Flores, director of Gef Pa'go Cultural Village at Inarajan; Joseph Quinata, Curriculum and Instruction Division of Guam DOE; Jeff Barcinas, Dean of the College of Agriculture and Life Sciences at the University of Guam; and his colleague John Brown, Associate Director of their Agricultural Experiment Station; Rosana Barcinas, Guam Preservation Trust; Earl Paulino, a local fisherman; and Ronald Laguaña, Chamorro Studies Division, Guam DOE. 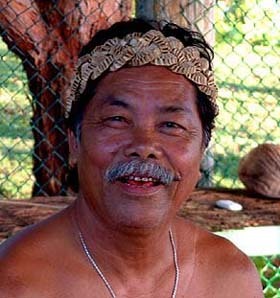 Follow these guides on a journey through Inarajan and Chamorro culture. Turn the page to see the location of this village.